Want to keep your truck bed nice and neat, even cover up what’s inside and keep it out of the weather? The answer may be a bed liner, tonneau cover, or maybe both. What do they cost, and can you install them yourself? What types are there? Which type is right for you? 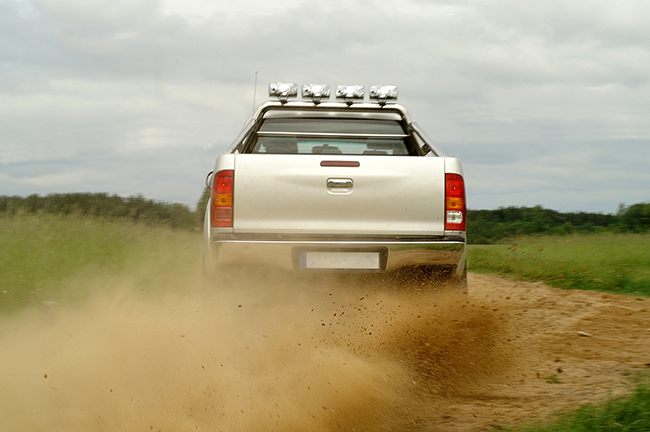 Here are some tips for protecting your truck bed and what you put inside it. There are essentially three bed liner types. Each has its advantages and disadvantages. The key is to determine how much you want to spend, whether you want to do the installation yourself, and how permanent you want the liner to be. Plastic slide-in liners: These slide into your bed and are anchored in a variety of ways. They don’t have to be permanent, and in fact, removing them from time to time to clean your truck bed is a good idea. This prevents rust, and keeps dirt and debris from scratching your bed when it becomes lodged under the liner. Brush or roll-in liners: These are actually applied with a paint brush or roller, just as the name implies. They’re permanent, as they adhere like another coat of paint. You can brush or roll them as thick or thin as you want, and they’re available in a variety of colors and materials. Spray-in-liners: These are also like paint, but they’re sprayed on instead of rolled or brushed. The lining comes in an aerosol can or a substance that can be sprayed through an air sprayer. Bed mats & rugs: These are even simpler solutions, and simply lay in the back of your truck, often held in place by hook and loop type fasteners. They can be removed for easy cleaning, and easily replaced if something goes wrong. Plastic liners are thin, form-fitting and easy to install and uninstall. You can do it yourself, and if they’re damaged, replacement is easy. However, they often contain open areas where there are natural holes in your truck bed, allowing water and debris to get underneath. They require greater maintenance because they need to be removed frequently for cleaning, then your truck bed needs to be completely dried out to make sure there’s no rust or corrosion. They’re also not as sturdy and protective (generally speaking) as the brush or spray-in liners. If you’re looking for an inexpensive solution and one you can remove when you sell your truck, this is a good option for you. Brush or roll-in liners can be much tougher than those that are plastic and slide in. They require you to prep your truck bed before installation. If you don’t clean and sand the surface first, the liner won’t stick consistently, creating holes and streaks. The advantage of these liners is you can make them as thick or thin as you wish with the number of coats you apply. You can install it yourself, or hire a professional to do it for you, although they most often use spray-in liners (more on those in a moment). Because these liners can be as thick or thin as you wish, a thin coat will often still allow the truck bed to be dented, scratched, or otherwise damaged by cargo. Repairing these dents or scratches can be a little tougher with the truck bed coating already applied. Overall, they’re usually a better choice than plastic liners. Similar to a brush-in or roll-in, these are sprayed on like automotive paint. Because of this, proper preparation and careful masking are essential parts of the process. If you have a commercial installer spray-in a bed liner for you, you’ll often get the best results. No matter what type of liner you decide to install, your truck bed will be in better shape than leaving it stock. Tonneau or hard flat covers cover the bed of your truck by placing a flat surface across it, as opposed to camper type bed caps that are often the same height or higher than your cab. These covers come in several types and are made of either a hard plastic of fiberglass. Fiberglass hard tonneau covers are typically a special-order item and are painted to match your truck. These types of cover limit the amount of cargo that can be carried in the bed of the truck as they’re fastened to the front of the bed and hinged up from the back or top of the tailgate. These are the most common and economical covers, typically made of heavy duty outdoor, UV-resistant-grade vinyl and mount to a frame attached to the truck bed either on top of the bed rails or inside them. Some frames require drilling, others don’t. The cover can be rolled up, as the name implies, to allow quick access to the bed. The cover can be removed or remain attached and strapped to the front of the bed when not in use. Their main con is they’re almost always black and you can’t set heavy objects on top of them. Also, a thief can get through them into the bed using a sharp knife. These are like roll-up covers, but they retract into a cartridge at the front of the truck, protecting them from the elements, but also allowing for easy access when not needed. These types of hard plastic or metal covers are a little more expensive than others due to the cost of the retracting mechanism, but for many truck owners, the convenience is worth it. They’re also more secure since they’re harder to break into, and you can set heavy objects on top of them if you need to. Rather than rolling or retracting, these covers fold up and can be removed. They’re similar in price to roll-up covers and are available in both hard plastic and soft vinyl types. Depending on the mounting system, the cover will either sit flush with the bed or slightly above it, making for a nice appearance. The hard covers provide a certain level of security soft covers don’t especially when the truck is equipped with a locking tailgate. These are another popular tonneau cover because they offer extra security benefits compared to a soft cover. They feature a locking frame that doesn’t allow the tailgate to be lowered when the cover is locked. They’re also sturdy, yet lightweight. Although they can easily be removed, it usually takes two people to do it. Following the reverse process and reinstalling them is equally simple. These tonneau covers can be painted to match your truck color, making them blend in seamlessly. They’re reinforced for durability and are the strongest type of covers available. However, they’re much heavier than their plastic counterparts. Most are removable but weigh twice as much as plastic. The removal process varies and is typically not easy. They also don’t provide easy access to the truck bed. Whichever option you prefer, keeping your stuff safe and protected from the elements is important. With so many options, you’re sure to find the right one to meet your budget and your needs.